This high-reach jack stand features a 748 kg. holding capacity. It expertly balances vehicles that are raised on a car lift. The RJS-1T high-reach jack stand is essential for any work that will change the centre of balance on your vehicle. When heavy pieces of equipment are removed from the vehicle for maintenance, the manufacturer-recommended lift points on that vehicle no longer represent the safest lifting points. To prevent accidentally and detrimental slippage or tipping, a high-reach jack stand is necessary to ensure safety and balance. Over 2,031 mm lets you work with virtually any car lift. When you pull a transmission or engine from a raised vehicle, you change the weight distribution considerably, and with vehicles that high in the air, you need a tool that can reach them with ease. Ranger high reach jacks are just the tool to keep everything steady. They’re also ideal for holding drive-train or exhaust components in position beneath raised vehicles. When a vehicle is lifted on a car lift, the RJS-1T High Reach Jack Stand is the ideal selection for stabilising your precious load. Totally adaptable, the hardened ACME screw adjusts to heights between ​1,382 mm and 2,045 mm, while the thick rubber on the stabilisation pad provides maximum support. Its 305 mm base plates ensure maximum stability during use. You’ll be impressed by how stable and secure your vehicle remains when performing some of the trickier undercarriage maintenance tasks. It addition to offering excellent support, the RJS-1T is incredibly mobile and lightweight enough to never strain your back or cause logistical problems when fitting it into place. 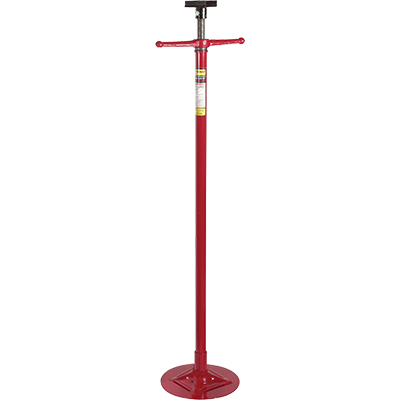 This high-reach jack stand is safe, rugged and entirely zero-maintenance for as long as you own it.